Discussion in '5th Gen 4Runners (2010+)' started by laMylaJ_panda, Apr 10, 2019. 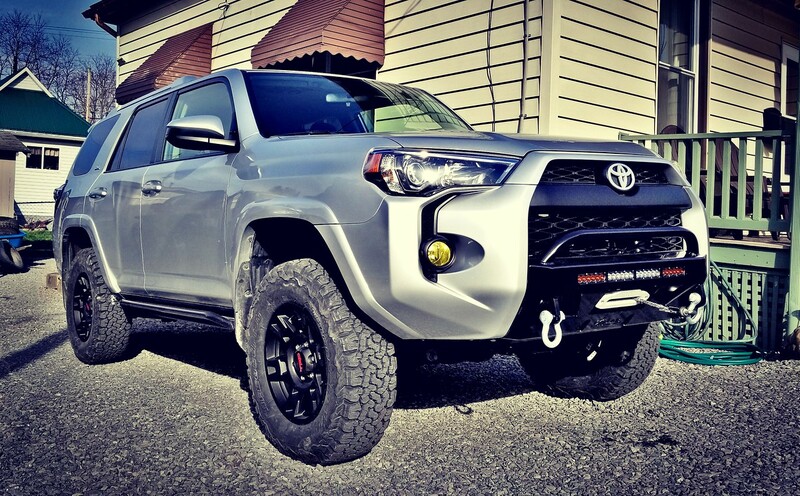 So I just bought a 17 4runner Trd pro and I am planning on ordering C4’s Lo pro bumper and I want to know if the pro set up can handle the bumpers weight? I am just starting to get into the offroad adventures that I plan on the future, so yes I am a rookie at this. 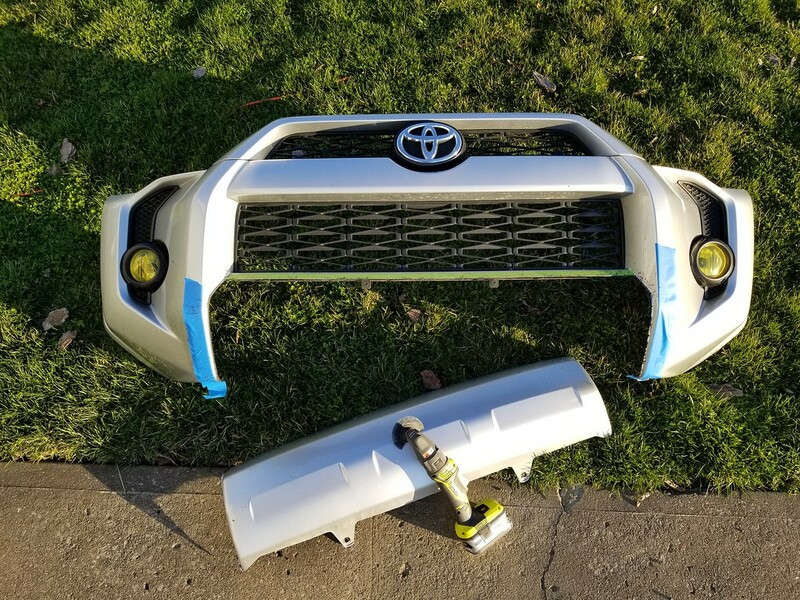 I want to start with the Lo pro bumper. Suggestions ? I think it does. How much weight on it? When I had mine I have probably extra 200lbs but that’s when I had the SR5 coilovers but with TRD Pro you have Bilstein and toytec coilovers so you should be fine. Get a Warn winch. USA made. The bumper is about 75 lbs. how much does the winch weight? Right now mine sits at 36 1/8 “ from the ground to the fender. And 36 3/4 on rear. Might sag a little on soft stock (even pro) suspension. I love my setup. 4Runner fun, travieb1 and WallyT4R like this. The VR series winches are Chinese made and manufactured and the Xeon series are USA made. See here direct from Warn themselves. Thats a beast! What set up is it? Nice. Do you have side shots? You say it might sag after the bumper, what do you think i should do? I was looking into the icon stage 1 or 2. ? I have the C4Fab Lo Pro bumper with a Smittybilt 9.5 winch with synthetic line. I went with the Eibach Pro Truck Lift. (shocks and coils) It really seems like one of the best bang for buck lifts out there that actually rides nice. My experience with Bilstiens are that they ride way too rough on the road. And I didnt want to drop $2000 on a suspension. But, I needed to handle the extra weight. The Eibachs have a bit stiffer springs than stock, and like I did, you can set the adjustable front shocks up one notch to account for the sag of the bumper weight. Mine sits pretty much level now. Rides great. Feels more planted and solid, less like an SUV, nose dive under breaking gone. DrewMan, laMylaJ_panda [OP], WallyT4R and 1 other person like this. Stock suspension is soft that’s why I mentioned it “might” sag. Here’s a side shot. DrewMan, laMylaJ_panda [OP] and WallyT4R like this. Beware that C4 is now cutting their logo into the light cutout area with or without lights. I’m going toward southern style to avoid this. I don’t wear logos I don’t want to wear. They’re not paying me to advertise for them. I guess I’m a little sensitive about being their billboard. Barcelona Trail, DrewMan, Doglover2003 and 3 others like this. Same reason why I didn’t go with their rear bumper. I ordered my low pro from them but with the TRD logo cutout. 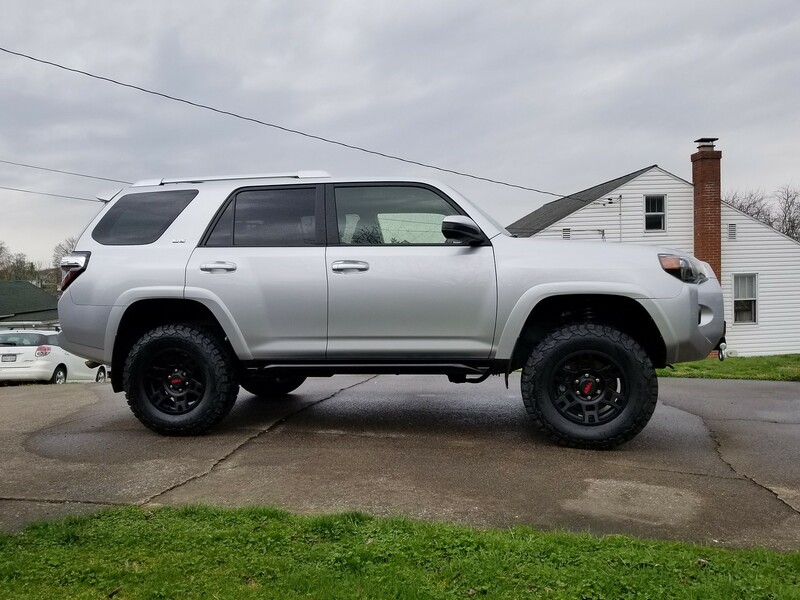 If I understand their change, it now looks like the trail,trd pro logos go into the bottom and the C4 will be more prominent in the Light space. Is that how you see it? Only pic I can find on their site seems to show this. Must have got mine RIGHT before the change. Mine has C4 Fab in the lower section. larger logo, but less noticeable, dont like that messing up the light bar looks. Bolt in slider plates from C4 aren’t my favorite either but really like the looks of them. May shift away from them if I find something else I like better. Powder coating isn’t a big deal for me although it does add some cost going to a third party. There are several places close by that an handle it. May be worth giving them a call or asking them about removing it for your bumper. If they won't take the logo out, their loss. Nah no worse then pulling the bumper cover and putting it back on, minus a section that’s easily marked for cutting. You made it sound too easy haha it probably is. I am more concerned on the 30” light bar and baja fog lights that i will need to installed along with it. HoBoDanny and SlvrSlug like this. WallyT4R and 2fingers like this. Just did some research on this set up and I think this is what I want and need to do right now. Will get the lift and handle the weight, thanks a lot for sharing. Your sr5 sits crispy clean! The install isnt that bad at all, for the bumper or the lift. The bumper cuts are fairly easy. Slight sanding takes care of any rough edge, and I bought some rubber door trim and put that on the edges after cutting. An oscillating cutting tool works REALLY well on the plastic bumper. For the lift, watch a couple youtube videos, search for 4runner lift install with out coil/strut compressors. Its pretty straight forward and easy. WallyT4R, Barcelona Trail, laMylaJ_panda [OP] and 1 other person like this. So I am waiting on the SSO Slimline bumper, I am installing an Eicbach 3” lift and i am planning on getting 285 tires. ? Any input on this set up? You will probably want to set the front to the second notch from the bottom, especially if you will also have a winch. Mine has settled out to be very level on the second notch. Whats your height from ground to fender line?